We are proud to produce outstanding Bengal kittens. 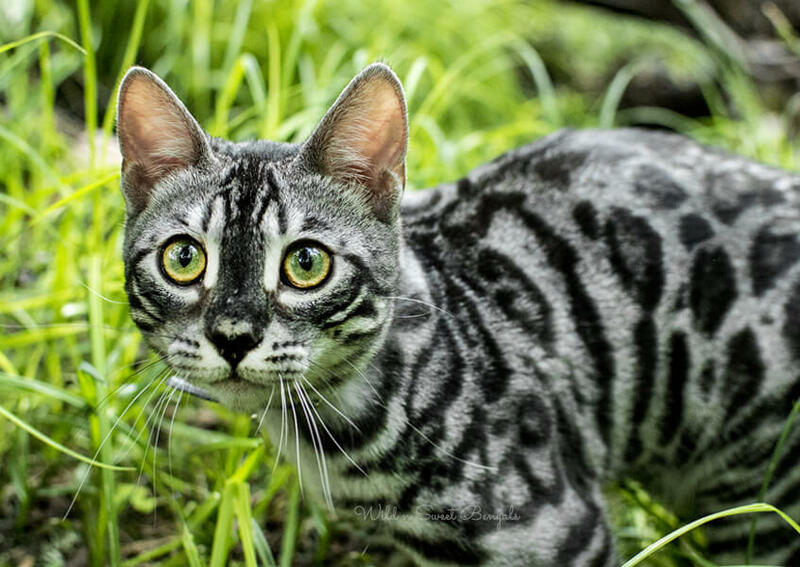 Our cats are always paired to create the most wonderful Bengal kittens possible. Raised with love and affection, all our Bengal kittens will fill your lives with joy, love and unforgettable moments! The question is: which of these beautiful couples will create the Bengal kitten of your dreams? By subscribing to our Newsletter, you’ll receive an email as soon as there are new kittens available on our website. This is a free service that allows subscribers to be the first to know. Success! You are now subscribed to our newsletter! Being on the Waiting list gives you priority to see our available kittens before they are posted on our website, and when your turn comes, you are first to choose before anyone else. To be part of this list, we ask a deposit of $500 which will be deducted from the price of the kitten at the time of purchase. Silver, Snow lynx and Brown Bengal kittens will be expected. This mating will produce breathtaking kittens with huge outlined rosettes, beautiful contrasts and gorgeous coats. Snow lynx, Snow mink and Brown Bengal kittens will be expected. This mating will produce amazing kittens with huge outlined rosettes, outstanding contrasts and short coats. Blue and Brown Bengal kittens will be expected. This mating will produce outstanding kittens with huge rosettes, beautiful warm colors contrasts and short coats.